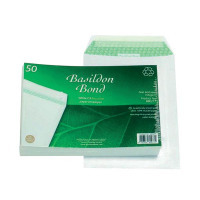 • Basildon Bond envelopes, shrink-wrapped, packed 50. • Convenient small packs for use on the move or in the home/office. • Peel and seal gumming. These environmentally friendly Basildon Bond envelopes are made from smooth, white, 100% recycled 120gsm paper. With a simple and secure peel and seal closure, these envelopes are suitable for unfolded A5 sheets, or A4 documents folded once. This pack contains 50 white C5 envelopes.